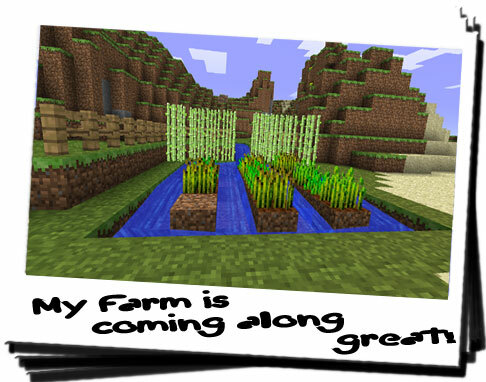 Diary of a Miner: Day 9: Farming and forging! I was up all night trying to make any sort of headway with that mysterious book I found, with no luck... As a result, I woke up much later than I expected which reduced the time I had to do what I intended: to go exploring. So, I put that off for another day, and decided to check on my farm: it was doing great! Only yesterday I'd planted the reeds and wheat, and already they're flourishing! I've yet to find a skill that I'm not good at! Although I've yet to try exploring, spinning cotton for clothes and using TNT. The exploring will be covered tomorrow, but as far as the TNT and clothing goes, I've yet to find time. I may experiment with the powder I found in the mossy chamber, as I suspect it may actually be sulphur; the key ingredient for making TNT! That'll make mining much easier on my tools and time! After checking on my farm, it was far too late to actually go exploring, so I went around to my forest to see if there was anything that needed doing. I was thinking about expanding the forest anyway, and I may have needed to flatten more of the earth. However I got distracted... again! This time by the lava pit I found awhile back. If I was going to expand my forest, it would be a good move to do something with it. So I thought it would make a good forge! The molten rock would provide the necessary heat for forging strong weapons and tools, act as a great place to store them, and could be as used as another entry point for a mineshaft! This would dramatically increase my chances of finding some good ore! The first issue was obviously clearing some of the nearby trees; they were growing worryingly close to the edge and I was afraid they'd catch fire and I'd lose my entire forest. I then turned my attention to surrounding the pit with cobblestone to ensure that is was secure from anything that might try to get in. 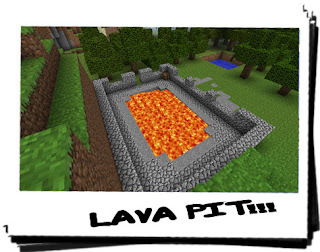 It would also stop any stupid or unsuspecting animals wandering into the lava. As a result, I decided to leave the wolf behind as I didn't want any accidents to occur! It was quite tiring making a cobblestone wall: first there was the mining of the stone from a nearby source, and then the cementing of it together. That teamed with the heat from the lava pit did not make a good working environment, but at least I got a base wall done. My only worry now is the proximity of the edge of the pit to the path. I may need to construct a fence so it can only be accessed from one side! Once again, safety being paramount... It started getting dark after I constructed a few furnaces for the forge, and I decided to call it a day. I hadn't realised how dark it actually was due to the overhang of the trees. Needless to say I was very wary about my darkened surroundings. It made me think that making a lit staircase or road for the area around my usual haunts would make it safer! Although then I heard a muffled groan and literally ran the rest of the way! For all I knew, it could've been a cow, but I wasn't taking any chances. The wolf had gone into the house by this time, and I found him curled up on my bed! After all the work I've done today, it wouldn't take long for me to join him in the land of nod! I'm exhausted! By the way, I named the wolf "Dash"! Definately suits his personality: he loves to constantly move around and get in the way. Although with a bit of work that might actually be worked into a positive. In any case, I'm off to bed, I'm pooped!